We need your help to build and win this campaign. Posted on November 1, 2018 at 6:00 pm. Free Speech For People Board Chair, Ben Clements, and Legal Director, Ron Fein, co-authors of the book, The Constitution Demands It: The Case for the Impeachment of Donald Trump, join WGBH Greater Boston to discuss why now is the time for impeachment proceedings against Donald Trump and Justice Brett Kavanaugh. Ron Fein on Rising Up With Sonali: What Does the End of the Mueller Probe Mean? Watch Now: John Bonifaz on Democracy Now! Order The Constitution Demands It Today! 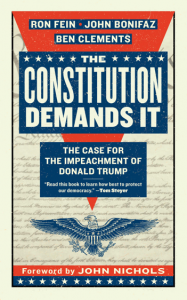 Written by a trio of veteran constitutional attorneys, The Constitution Demands It, makes the definitive legal case for the impeachment of Donald Trump.